Burj Al Arab. Yes, you read that right. 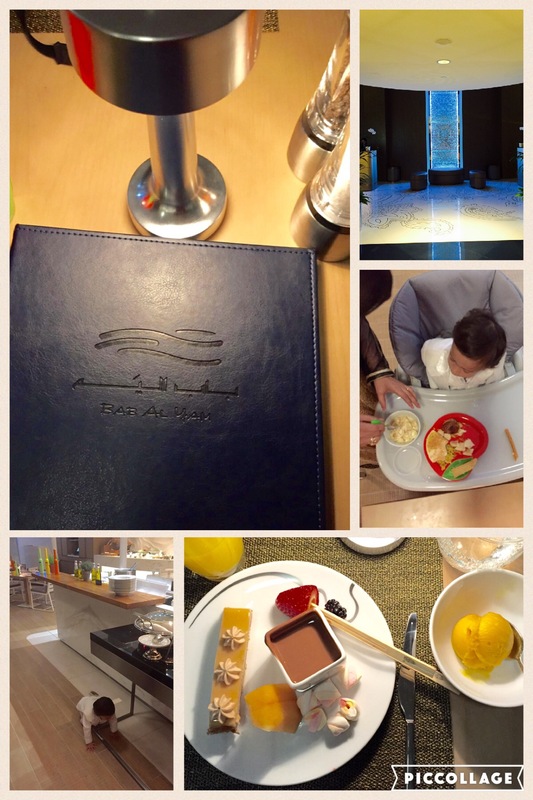 My family and I had the most amazing dining experience in the world’s only 7 star hotel as well as the world’s most luxurious hotel. 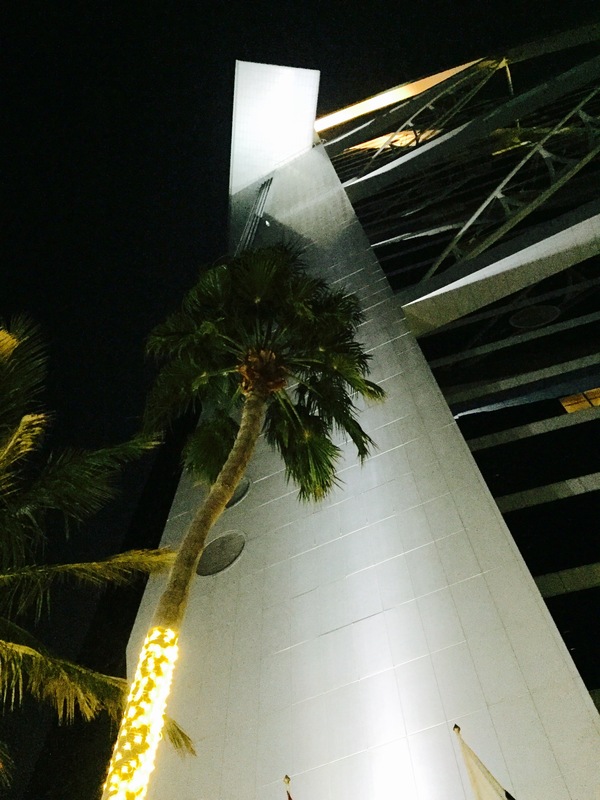 Below I share with you a few photographs from our spectacular evening, so read on to take a look inside the masterpiece that is Burj Al Arab! You would’ve already seen a few sneak peaks if you were following me on Instagram and Snapchat (Username: zenisanj), so be sure to give me a follow to be the first to know! 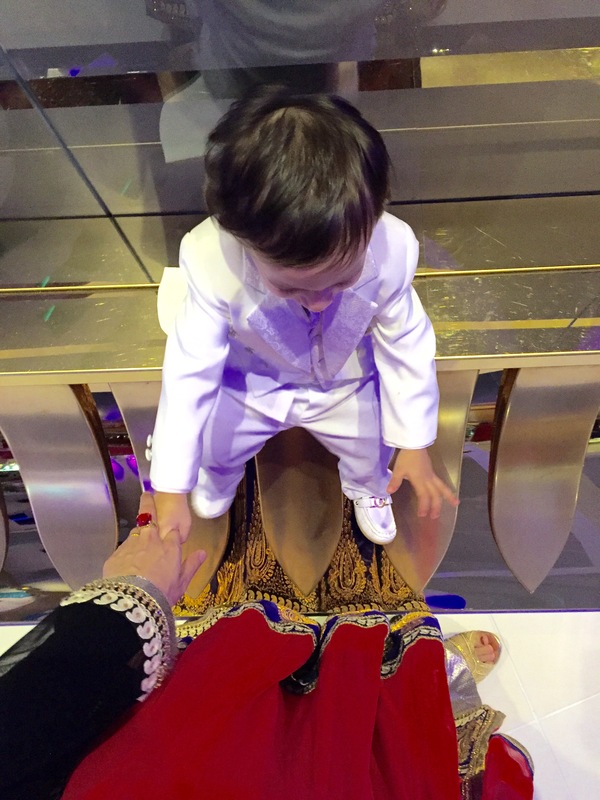 It is not every day that you get to walk in to Burj Al Arab, and this was no ordinary event for us either. 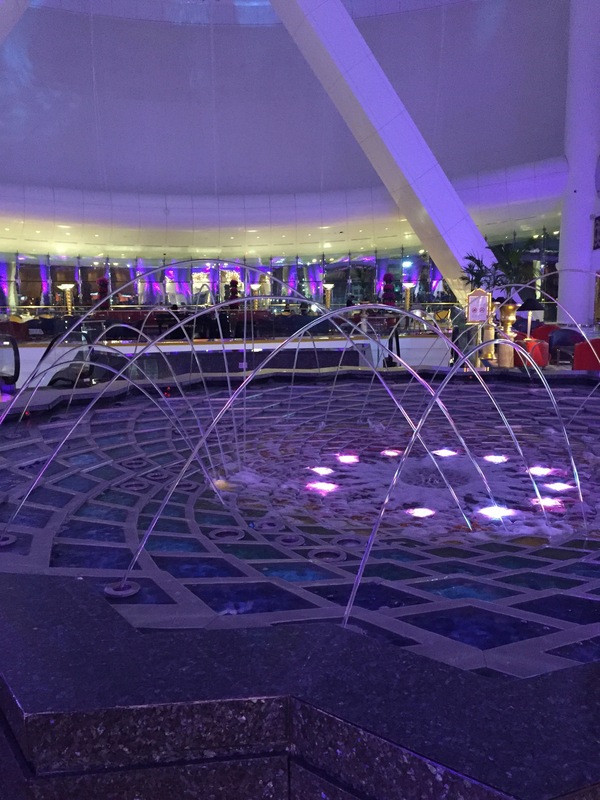 We were celebrating my husband, and his family’s, 25 year long stay in the city of Dubai and what better way to spend it than to go to Dubai’s most iconic spot. A Silver Jubilee for the family! 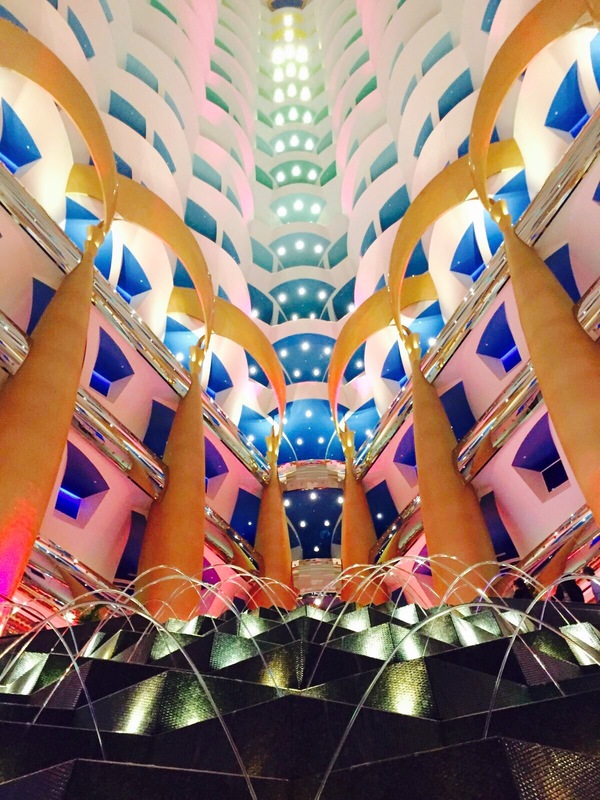 We were greeted with this stunning interior as we walked into Burj Al Arab and it was hard not to be amazed. All the photographs in the world can not do justice to the view that was in front of me. Baby Z was also fixated with the water fountain and the aquarium on either side of the room. 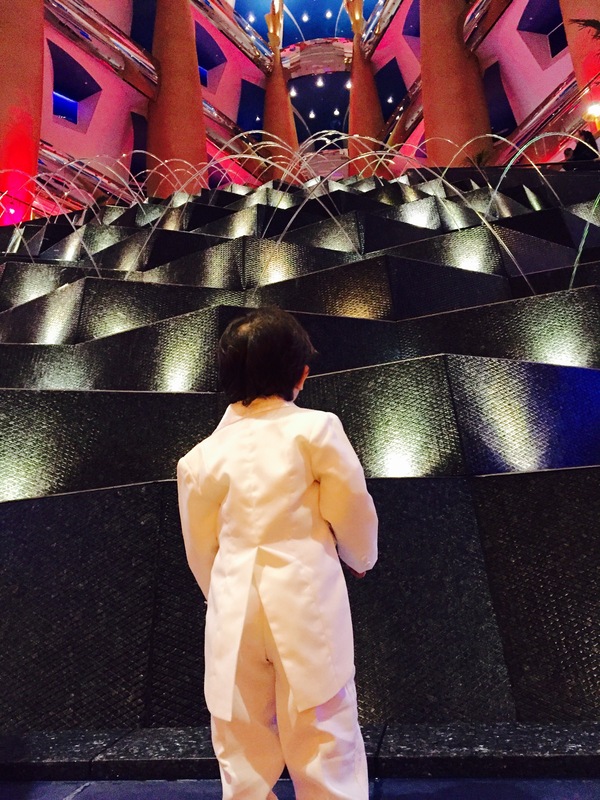 Also, how adorable does this boy look in his white 3 piece suit with a tailcoat? 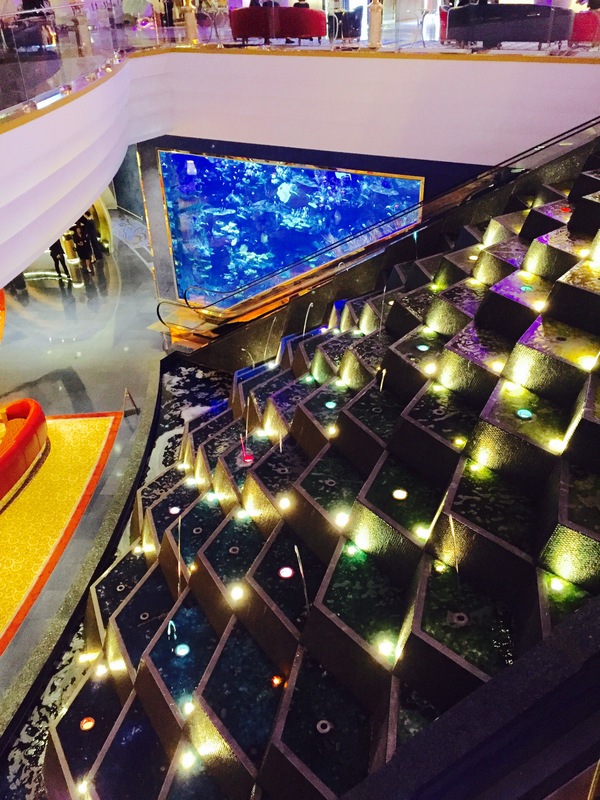 After admiring the view long enough, we made our way up the escalators, watching the fishes swim by in the aquarium and entered the main lobby, with shops and restaurants lining either side. 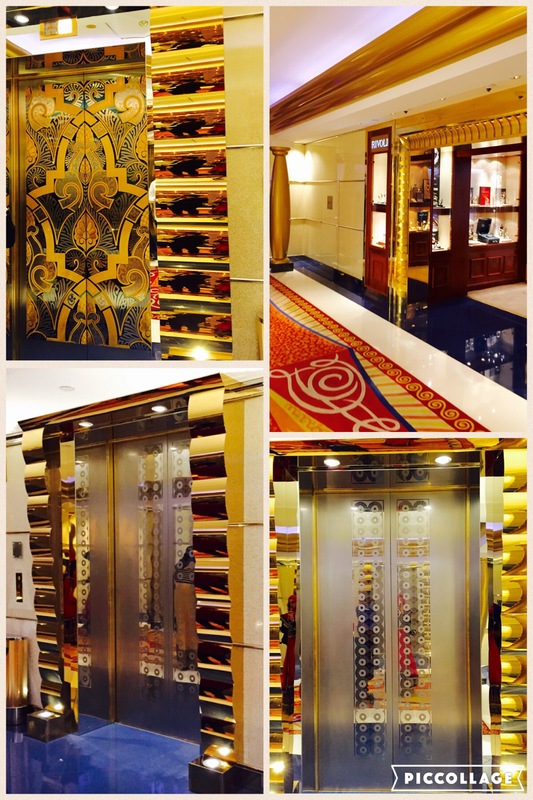 Below is a collage of the gorgeous detailing on the lifts in the main lobby as well as those of the ground floor. How magnificent! 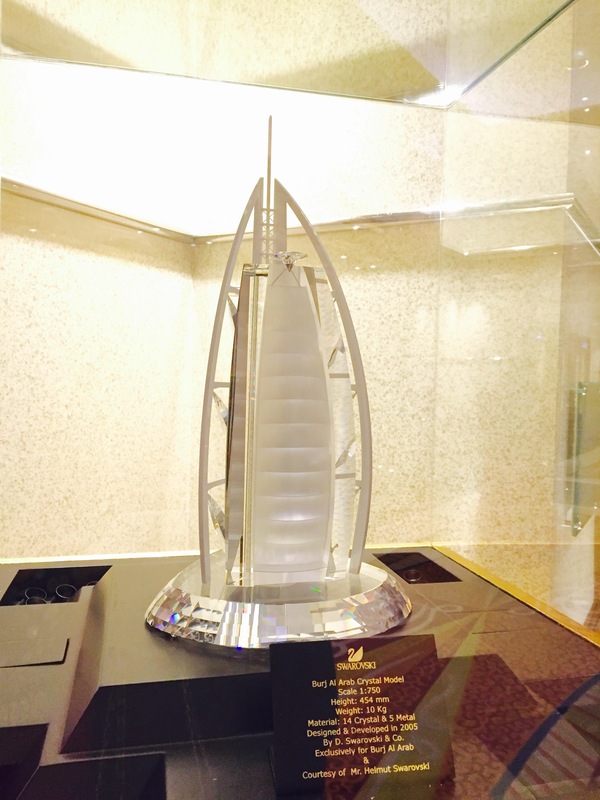 The main lobby also held a miniature sized Burj Al Arab, made of crystal by none other than Swarovski. 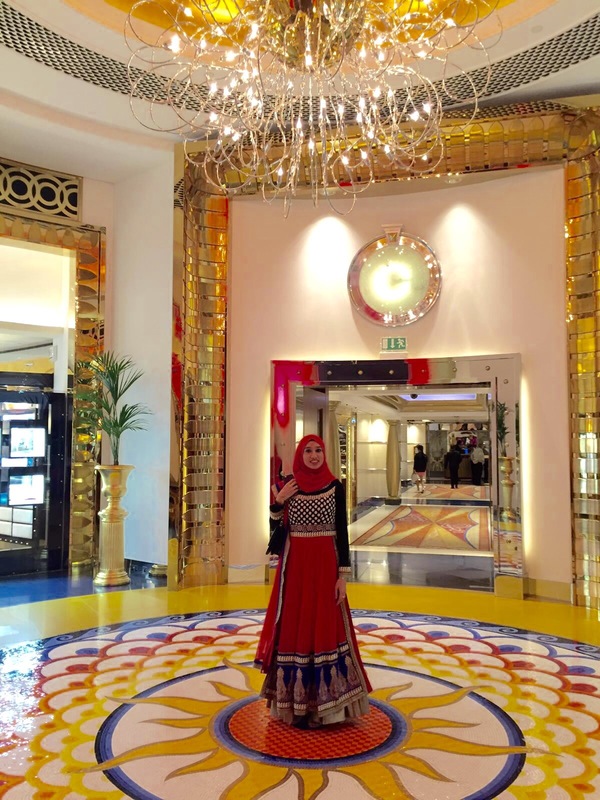 As we walked into the lobby, we were greeted with even more shiny decor and I loved the colourful mosaic floor, where I simply had to take a picture. 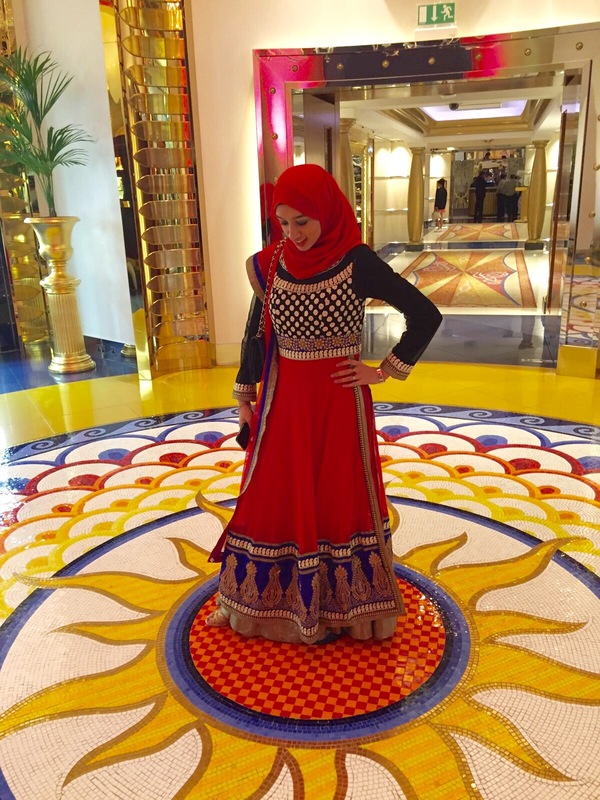 My gorgeous dress is from India and was gifted to me by my parents when they traveled there for a short holiday. The dress makes me feel every bit of a princess, especially when I give a quick twirl, which my husband has caught me doing on numerous occasions! Oops! Just look at the dress though…who could resist not twirling in THAT? 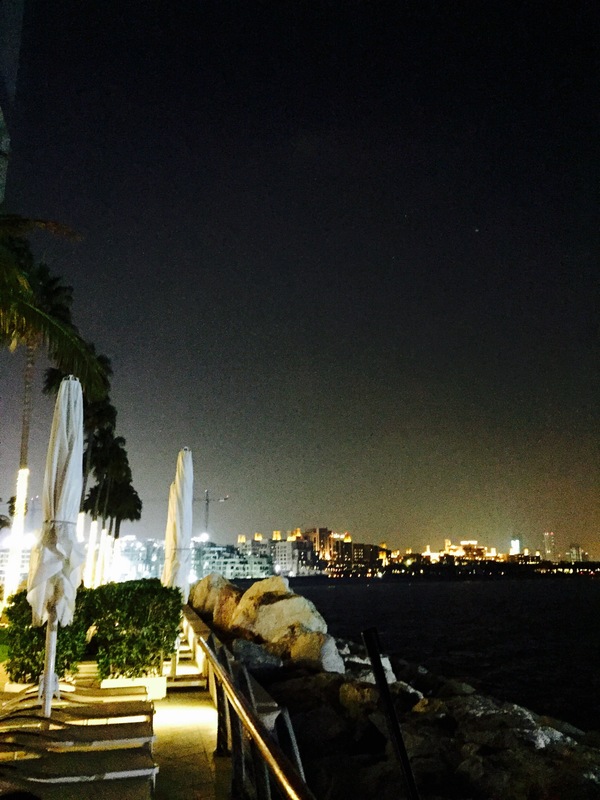 Our dinner was booked in Bab Al Yam, which was on the ground floor at the back of Burj Al Arab, with an outdoor seating area, looking out to the sea. We caught the lift down and headed out in the sea breeze as our table was being prepared for us. Looking out at the view, I can only imagine how stunning it must look during the day time. It was getting rather chilly, thanks to the sea breeze, so we headed back in for our meal. We were pleasantly surprised to find that not only was Baby Z’s baby chair ready at the end of the table, it also held his very own plate, bowl and cup with dishes suitable for a toddler. The plate had potato, rice and a bowl of pasta with white sauce, and Baby Z spared no second devouring the contents! I think he had already gobbled down half his meal before I put even a single morsel of food in my own mouth! The cuisine was delicious and included seafood such as oysters, clams, crab, prawns as well as the good stuff like chicken, steak, pasta and salads. I really enjoyed the desserts too including the chocolate fountain, mango ice cream and berries. You can see in the above photo collage on the bottom left that after having his meal, Baby Z was in a mischievous mood and insisted on crawling around the restaurant. Toddlers eh? Keeping it real! He obviously had no care in the world that we were seated in a seven star hotel, but hey he was having fun, and that’s what was even more important! I must mention that though the cuisine was absolutely delicious, especially the live cooking stations, the service was impeccable. It was by far the most helpful and genuine experience of service I have received in my life. To give you a little snippet of their hospitality, let me tell you that not only did they fill my bowl of soup, another gentleman offered to hold the bowl for me and bring it to my table. I must admit I felt rather daft and useless walking towards my table, with a gentleman holding my bowl right behind me, but I suppose it was fitting since I was wearing a princess gown and was eating in the most luxurious hotel in the world after all, eh? In all honesty though, I truly appreciated how each and every waiter would go out of their way to make sure we were having the best night of our lives. A special shout out to the waiter assigned specifically for our table, named Sonam, who did an amazing job! 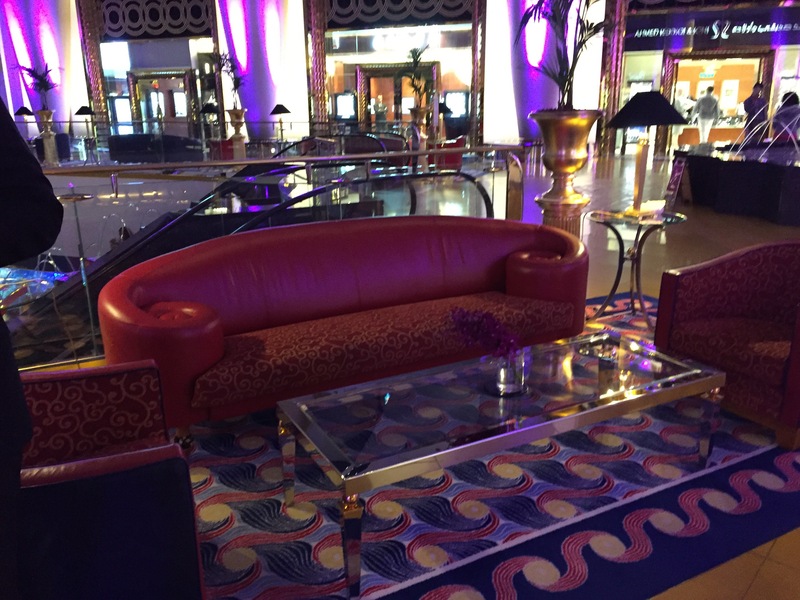 Once dinner was complete, we headed back up the lifts and into the main lobby, where we sat down to admire the interior on the most comfy sofas, people watching and admiring every detail of the decor. By the end of the night, we were all pretty happy, our tummies were filled and we were all feeling blessed, Alhumdulillah. Baby Z by this point was on a high, even though he had not consumed any sugar, but it was great to see him play in the lobby and chat with passers by, as we proceeded to take as many selfies as possible and soak in the ambiance. 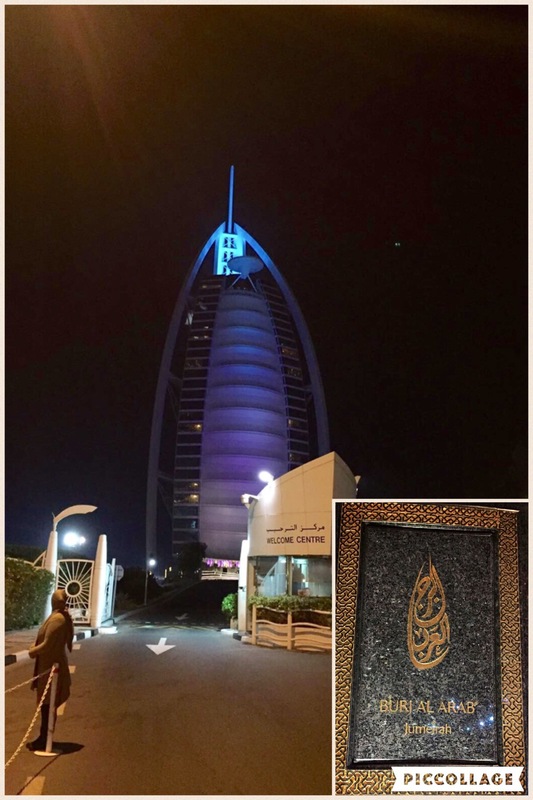 Perhaps when we celebrate the golden jubilee, after residing in Dubai for 50 years, we will book ourselves in to spend a night in this very same hotel. Perhaps…. In sha Allah! 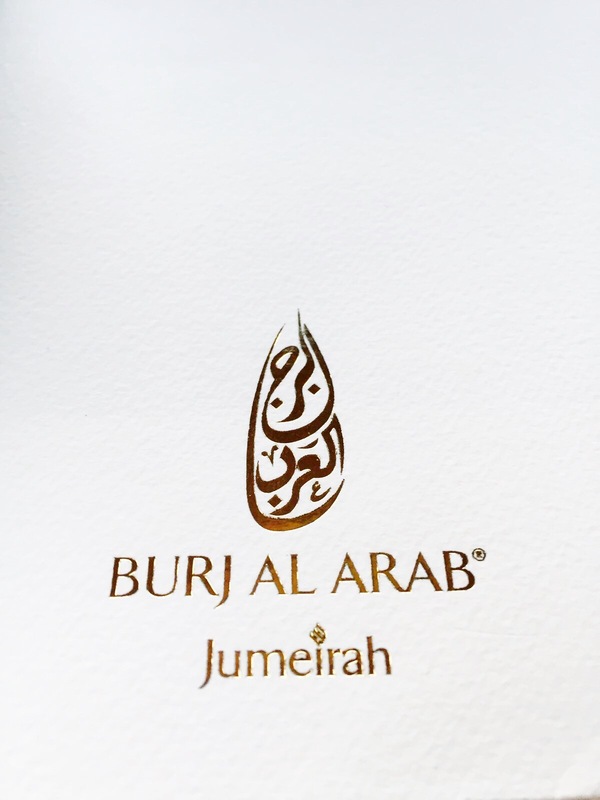 Note: This is not a sponsored post, and I have not been asked or paid to mention Burj Al Arab or the restaurant, Bab Al Yam. All opinions are honest and solely my own. 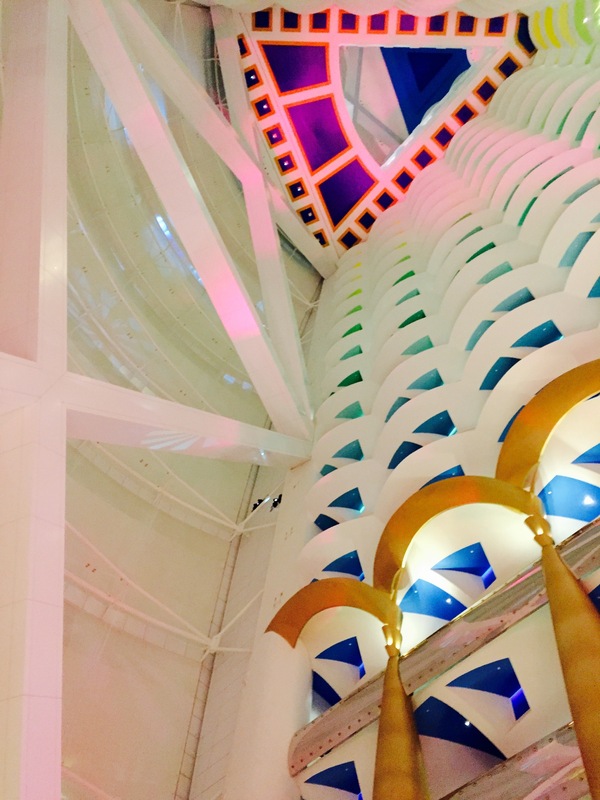 What did you think of the Burj Al Arab interior? Have you been to the hotel, and if so, what has been your experience? Please feel free to share your thoughts in the comments section below! Thank you! Thank you! You really must! It is simply gorgeous! I was the same and I have lived here for the past 2 years! It was such a great experience, and definitely a place to visit once in your lifetime! (If you have the means to pay for it of course!) Thanks for reading! I happened across your page through Facebook, of all things. Just had to leave a comment on your dress – it’s absolutely gorgeous! Aww thank you so much! I absolutely love it too!! Kinda wish I could wear it everyday… Hehe! ? It really was like a dream come true!! I still can’t believe it actually happened! Thanks for reading! ? Thank you so much for your kind words. It was surreal!! Thanks for reading! ? Husband and I visited one of the restaurants on our honeymoon. Speechless. It is the most amazing building. We went to the Asian Fusion restaurant which was out of this world. Oo I am sure it was! Definitely one those places you have to witness once in your lifetime. Thanks for reading! ?